Hiker-friendly, dog-friendly, horse-friendly trails just six miles south of downtown Portland. Tryon Creek State Park has a fantastic, well-maintained trail system that’s a great alternative to Portland’s downtown Washington Park and Forest Park. It’s a super family-friendly area with a Nature Center that hosts kid’s events year round. This entire area is relatively small and therefore easy to navigate. You’ll also have full cell service up here, and all of the trails are trackable on Google maps. Begin to the left of the Nature Center on a paved path, and turn left onto Ruth Pennington Trillium Trail. Keep left at the Upper Loop junction. Keep left onto the Old Main Trail. Reaching the Big Fir Trail junction, keep left again for Obie’s Bridge. Keep left again at Red Fox Trail to cross the Red Fox Bridge. Your first right is at a junction with Iron Mountain Trail. Cross the Nettle Creek Bridge. Now you’ll reach your first real road; Andrews Road, where you’ll turn right onto Atwater Road. Along the street you’ll reach a junction where you’ll turn left again for Red Fox Hills and eventually re-enter the park via Red Fox Trailhead. Go left at the Cedar Trail junction. Go right at the Hemlock Trail junction. Cross Park Creek over Bunk Bridge. Go right from the West Horse Trail to the Englewood Horse Trail. Go right onto Boones Ferry Horse Trail. Turn left towards High Bridge and cross over Tryon Creek. Go left on the Lewis & Clark Hiking Trail, crossing the tiny Terry Riley Bridge. Keep right at the 4th Avenue Trail junction. The next junction will be unmarked; go left until you meet the North Horse Loop, where you’ll go right. 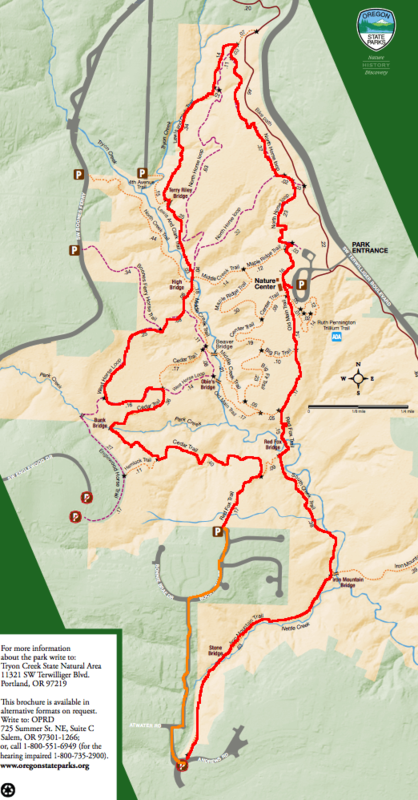 Go left towards Equestrian Parking, which will lead you to the Maple Ridge Trail, and finally back to the trailhead. This route is really easier done than explained; just keep a general counterclockwise direction and follow the map above. Even if you get lost, you won’t be more than a mile or two from a trailhead or map! I live in Portland so it's a quick 15min drive to Tryon. The park isn't that big but it's perfect for a nice trail run. It's well kept well, with mostly flat soft terrain but there are a few inclines in the larger loops. Horses are ridden here frequently so be prepared to leap over the occasional poop pile. Mixed terrain and well groomed trails make Tryon Creek a great spot for the family. It's heavily wooded which offers protection when the weather is off. It can get wet so take some waterproof footwear.